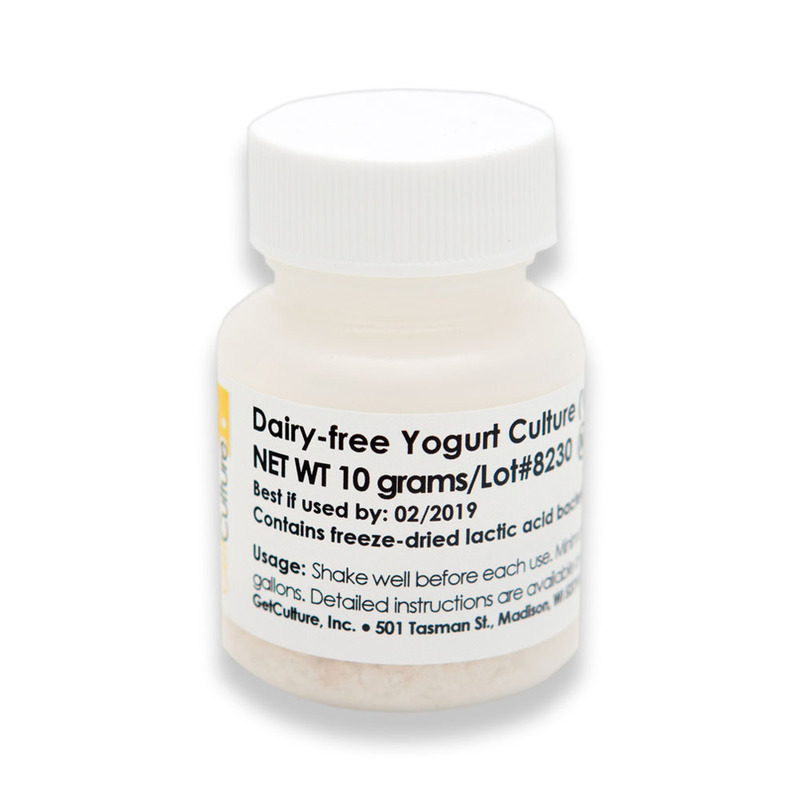 Dairy-free Yogurt Culture is a blend of dairy-free freeze-dried lactic acid bacteria specifically selected for use in making dairy-free yogurt. This culture results in a mild yogurt flavor with a smooth texture and medium body. Dairy-free Yogurt Culture is ideally suited for soy or rice milk, but can be used with animal milks as well. Incubation temperature of 106-110ºF for 7-8 hours, until thick. Important note: when making soy yogurt, you can follow the standard yogurt recipe; however, if using coconut, rice or almond milk, you will need to add a carbohydrate source (such as sugar) and a thickener (such as agar agar, pectin or gelatin) due to the nature of these types of milks. 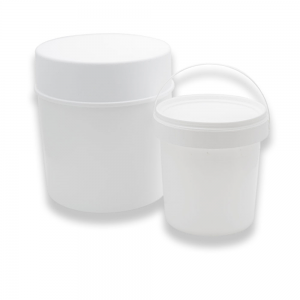 When using freeze-dried yogurt cultures, you will find that best economy is achieved by making larger batches. Home yogurt-makers will need to do their own measuring, dividing and experimentation. Small - contains 10 grams APPROX. 5 tsp. 1/4 tsp. for up to 2 gallons of non-dairy milk (i.e. soy or rice milk). Important note: when making soy yogurt, you can follow the standard yogurt recipe; however, if using coconut, rice or almond milk, you will need to add a carbohydrate source (such as sugar) and a thickener (such as agar agar, pectin or gelatin) due to the nature of these types of milks. Link to Yogurt How-to Video available above and in Resources section. Who provides the Kosher certification for the Yogurt cultures? All of our yogurt cultures are certified Circle K by Rabbi Don Yoel Levy, Kashuth Administrator. We will email you a copy of the Kosher certificate. Hello, Is the yogurt culture kosher certified ? Yes all of our yogurt cultures are kosher certified by OK kosher. I made, or attempted to make, non-dairy yogurt yesterday (I used vanilla soy milk and no added sugar, only added vanilla, used the yogotherm and used the non-dairy culture) and it did not come out right. It started out thicker but then I mixed it up then it turned very watery (basically its original soy milk state), not thick at all, and has little ball chunks in it. I followed the regular yogurt instructions (watched Dave's video and used a double boiler) and let it ferment for a total of about 15 hrs. Any advice on what may have happened? I would really appreciate it! Working with non-dairy milk is tricky. We have found soy milk yogurt works best with a thickener and sugar added. We actually just made some in the store the other day. We used 1 tablespoon of cornstarch and 1 tablespoon of sugar per 1.5 cups of soy milk. You don't need to use as much sugar but some is helpful, to give the bacteria something to eat. If you didn't want to use cornstarch, gelatin and Pectin powder work well as thickeners too. Just an FYI, but when you use gelatin or pectin your yogurt needs to thicken up in the fridge for 24 hours after the incubation time. So you would incubation you yogurt (with the gelatin/pectin in it) then after the incubation time you would shake/stir it, then put it in the fridge for 12-24hrs to let the gelatin set. Is this culture direct set, single use or may I reculture further batches from a previous batch of yogurt. Also how to store for maximum vitality? The Vegetal Non-Dairy is a direct set culture. It is possible to re-culture from a previous batch but we do not recommend it. Batches will be more consistent using the culture each time. Keep in mind probiotic cultures typically do not re-culture. For maximum vitality of all of our yogurt cultures please store in freezer. I'm looking to make a raw (not heated over 118Â°) vegan yogurt. Does the "milk" need to be heated prior to adding the culture? The culture should be added once the temperature of fermentation has been reached. The reason is to prevent an overshoot on the temperature and killing off the culture. I make yogurt from goat milk for some friends. A few of us are so sensitive to cow's milk, that it seems we get a reaction from using your other cultures for making yogurt. Would I be able to use this product? Yes, this product doesn't contain any milk products and will work in your goat's milk. I'm a vegan and would love to know if this culture was grown on dairy. The Vegetal/Dairy-Free Yogurt culture is absolutely not grown on dairy/lactose -- it is specifically made for those who choose to or must avoid dairy entirely. Could you tell me if this culture is gluten free? Unlike most other cultures, because this is a dairy-free product, barley (instead of lactose) is used as a fermentation nutrient in this product -- that said, the negligible amount that remains after production of this culture is below that of US and EU labeling requirements. We have product data sheets that are always available to our customers by request with this (and other) detailed information. I will go ahead and send you this data sheet. Thank you! Product rating - Click stars below to rate product. Works well, and is very economical. 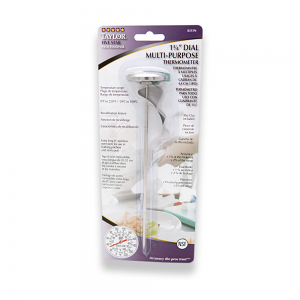 So glad to have found this product. Made no boil yogurt in my pressure cooker with a yogurt setting. Simply added the culture to soy milk straight out of the carton. This culture is superb for this application. Added the culture to two glass jars, gave it a shake, and 9.5 hours later, I had perfect yogurt. The cultures here are better than any other I've tried.